When your kid is tactile defensive and can’t stand things touching his skin, putting on sunscreen can be an absolute struggle. I’m sharing my sunscreen ideas and tips based on personal experience in how to get your kids protected in the summer and stop the sunscreen drama. If you have a kid that can’t stand clothing tags, doesn’t like hugs and cuddles or can’t stand her hands getting the least bit dirty, you probably have a tactile defensive kid on your hand. The sensory systems in tactile defensive children are hypersensitive to the stimuli they receive. For example, we may not even physically register a clothing tag; but for a tactile defensive child, it can actually feel painful, like someone is poking them with a pin. With summer here, we have to protect our kids from the sun. But when you have a kid that freaks out over anything touching them, sunscreen can be tough! Here are my personal tips to protecting your children’s skin from the sun. This post contains affiliate links. This may seem like a no brainer, but don’t tell your child right before you’re putting on sunscreen that this has to happen. Talk about sunscreen when you don’t have to put it on. At dinner, mention the beautiful weather tomorrow and how you’re looking forward to getting outside. But then also mention how important it is to keep our skin healthy and that we’ll need to put on sunscreen. Ask your child why we need sun protection and get him in the conversation. Talk about the fact that it’s not smart to go outside and play without sun protection and that everyone in the family is expected to participate in getting lotion on. Even if he’s three, he’s listening and absorbing a lot more than you might think. Yes, you read that right. Do yourself a favor and skip the sunscreen lotion. Instead, use spray sunscreen. Kids who are tactile defensive have a really hard time having someone rub them down. Add in the feeling of lotion and it can feel like torture! With spray sunscreen, you just generously spray down your child (not the face) and make sure they get covered. 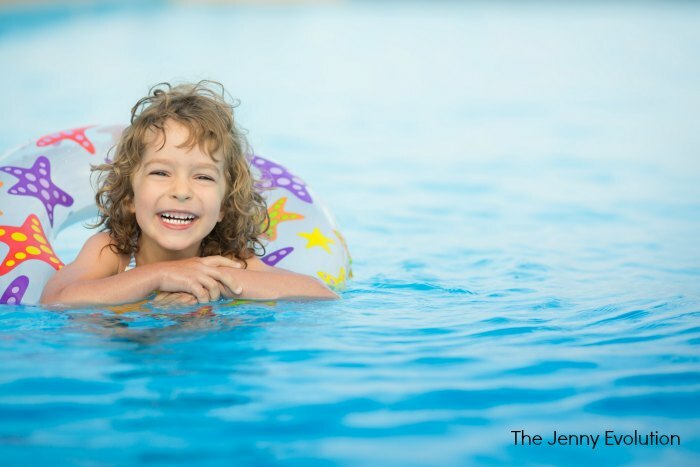 Don’t forget to reapply every two hours — especially after swimming. I’ve found that there’s no argument anymore when we have to reapply because my son knows how easy it will be. When I learned about the Neutrogena Sunscreen Ultra Sheer Stick, all I could think was, “Where have you been all my life?” It’s basically sunscreen but in a solid stick. You just rub the stick on your child’s face and you’re done! 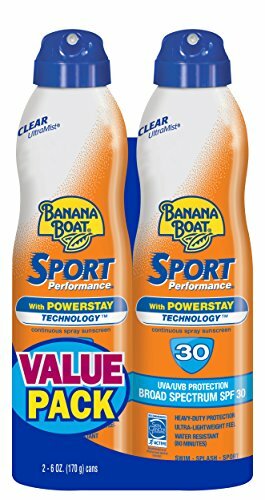 Once we discovered this product, the fighting about getting sunscreen on my son’s face went away. Now my son will even apply his own sunscreen to his face. It has been a true life saver! Parents love sun protection shirts for many reasons (often called rash guard shirts as well). But the best part is you don’t have to worry about reapplying sunscreen on the shoulders, arms or chest. Many of these sunscreen shirts offer SPF 50+. Just be sure to check the label. Not all sun protection shirts are created equal. 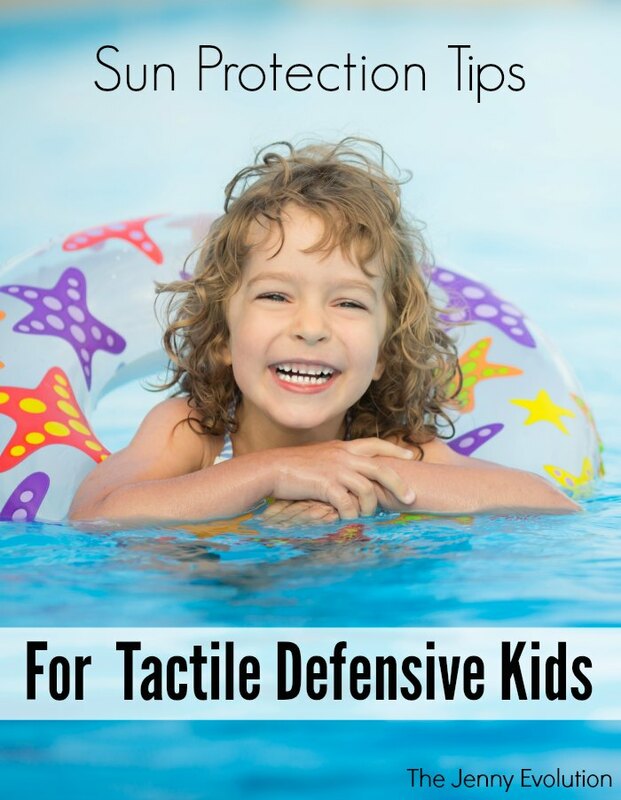 Depending on your tactile defensive child, this may be a hit or a miss… but it’s worth a try! One of my son’s loves his sunscreen shirts; the other one… well, let’s just say if he could be naked all of the time, he would be. Tactile defensive kids want to wear as little as possible… but this is where negotiation comes into play. Your child may be more willing to wear a sun protection hat if he knows that he won’t have to get lathered in lotion every hour. Again, this may be a hit or miss. But every time I assume my son won’t be interested in a compromise of this sort, I’m always surprised. Have your child be part of the process in choosing sun protection. 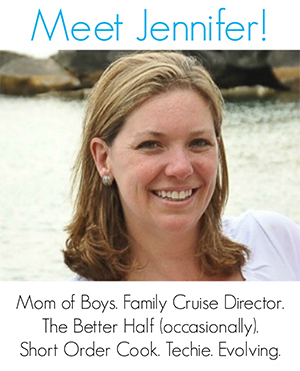 As parents, it’s our job to make decisions for our kids. But the more you can include them in the process, the better buy-in you’ll get and less fighting about sun protection. Have your child pick out their sun protection shirt. Bring your child along to purchase the sunscreen. Talk about why we wear sunscreen and how important it is to keep our skin healthy. And when it comes time to actually put on the sunscreen or sun protection items, why not have your child help you get ready, too? Have them put some lotion on your legs. Or let them choose which of your two sun protection shirts you’ll wear that day. Empowering your child to make some of the choices will go a long way! Isn’t that stuff awesome! If you haven’t tried the sunscreen stick yet for the face, definitely do it! My son was the one who mentioned it… he saw someone using it and asked about it. We had to search because it had just come out at the time… but boy did it make a difference. I recently learned from my dermatologist that RIT makes a sun guard treatment. You can wash it in with any clothes and it ads an spf factor. It may be something very handy for a child who only wants to wear certain clothing or hates sunscreen. Great, useful post! I find that my kids are getting really tan with just the spray sunscreen. I wonder if it’s as effective, or if I’m just not putting it on effectively. Heather — that can happen. Make sure you’re getting SPF 50 and make sure you’re getting enough on. It can be easy to just dust them with sunscreen and not get enough on. And for the shoulders, I put on a little too much on purpose and quickly rub it on. Bought the stick based on this blog, he lets me use it on his face. I’ve combed the internet looking for ideas, would love to hear of something you’ve tried. For now I’ve been placing the sunscreen on top of the cable box (or some similar appliance). I find it noticeabl warmer, but for my son, still not warm enough. Yes! Lotions are often chilly… even doing regular lotion can be like that. The stick isn’t really cold, but your child may be sensitive. Have you ever thought of using a baby bottle warmer to warm up the sunscreen lotion?